If you are missing one, a few, or all of your teeth and would like to regain your ability to eat, speak, and smile with confidence, then dental implants may be for you. 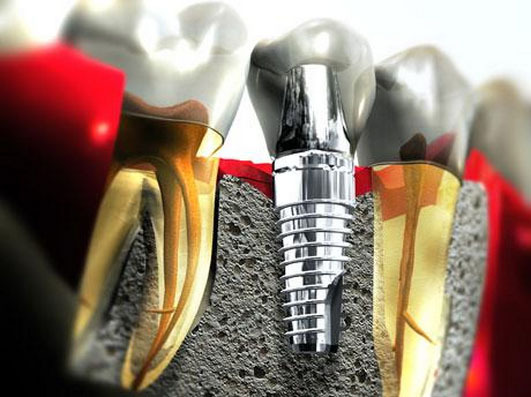 Dental implants are a permanent solution for tooth replacement. Through a simple and safe surgical procedure, a small titanium anchor is placed into the bone where the tooth no longer resides. As the healing process occurs, the titanium implant integrates with the bone to provide a sturdy foundation for a replacement tooth. Your doctor will then attach an abutment to the implant, which then is covered by a beautiful, tooth-colored porcelain crown. Dentistry has advanced to the point where dental implants are the most ideal and reliable treatment option to replace missing teeth. Dental implants are the only option for permanently replacing a tooth while not removing tooth structure from adjacent dentition. Dental implants are also great options for anyone who has struggled with dentures or failed bridges in the past. Those with lower full dentures will probably attest to the frustrations of a denture that slips around or pinches them when they talk and eat. The standard of care in dentistry has become the implant-supported overdenture. A minimum of two implants is recommended in the lower jaw where a full denture can be attached to provide greater retention, support, and stability. Whether you have been without teeth for a long time or you have a broken tooth that you want replaced with an implant upon removal, our highly trained dentists can educate you on the benefits of dental implants. Let us help you determine if implants are the right solution for you. Request an Appointment Today!